Summer Road Trip part 2: And the Monkey Bit Me! A few days ago, I started telling you about my summer road trip. In part one of my adventure I talked about letting go as a parent. We dropped off our son, Adam, at The Citadel for summer school. It was certainly an emotional event for me to set him free, let him fly and start making decisions on his own. I just have to trust that we did the best that we could do raising him and the rest is up to Adam and God. The second leg of my road trip brought me here to St. Mary’s, GA to visit with my sister. Her husband is away for a few days on a business trip, so this freed the way for us to PaRtY!!! Can I just say that the idea of us having a big throw down party is hil-lair-e-us! Susan and I are proudly known as The Two Squares. We listen to the stories our siblings tell us and just shake our heads. All six of us sibs get along great considering how different we all are, but Sue and I just seem to “get” one another. We have a lot more in common, than not. 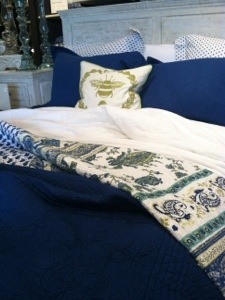 Our time together was spent sitting on her screened porch overlooking the St. Mary’s marsh, shopping-( which is where we found this gorgeous bedroom set…lurve it! ), eating some delicious food, drinking some wine and talking, talking, talking. Oh yeah….there were a few puppies to love on too. I LOVE dogs! I have two of my own, but these two are a hoot to watch. 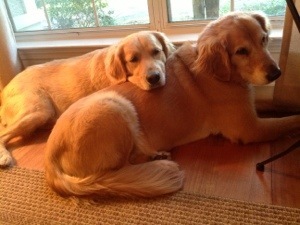 They will wrestle, play fetch and give the best golden loving ever. Sue even has an old kitty named Kitty (of course). In her old kitty cat years she has become quite lovey dovey. I like that. Sadly, after two days we had to say good-bye. Nothing better than kissing her sweet face for the first time in months. I am soooo proud of her, the choices she is making and the way she is living out her life intentionally for God. 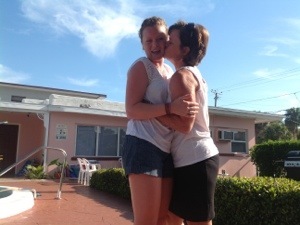 She and 30 other college aged kids are living here in this pink motel for the summer as they go to work at Dunkin’ Donuts, Surf Style surf shop or the Mighty Pirate Ship (…arggggh, just had to say it) 5 days a week, evangelize on Saturdays and worship on Sundays. Visiting Mary Claire during this project helped me put the puzzle pieces together into the big picture. The kids are discipled the first five weeks by adult leaders. Then the leaders prayerfully place each kid into different leadership roles, which the kids take on immediately for the last five weeks of the program. Mary Claire was chosen as one of the three head project leaders. She was completely taken aback by this commission and scared out of her mind. 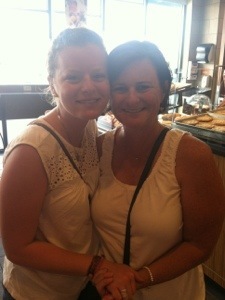 But as I reminded her, if the adult leaders truly prayed about it, then God knew exactly where she needed to be. She now had to trust God in her new position and obey. This was an amazing opportunity for her to refine some skills like time management, and to learn some new skills like addressing problems in a group and conducting meetings. My first night there, Mary Claire had just finished an 8 1/2 hour day at the surf shop and she had 30 minutes to say hi to me and freshen up before bible study that evening. 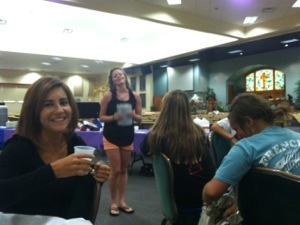 It was a special night because an unbelieving co-worker from the surf shop wanted to join the girls in bible study. When the study ended at 9:30pm, more meetings with group leaders was waiting for her back at the motel. Needless to say, her head didn’t hit the pillow until after 1:30 in the morning, only to begin her day early the next day. 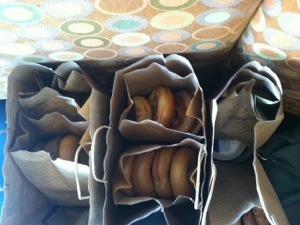 I bought bagels for the whole project to eat in the morning. I figured they would like something different to start their day. It’s funny how these kids are so grown up in many ways, but so many if them needed a mom hug. 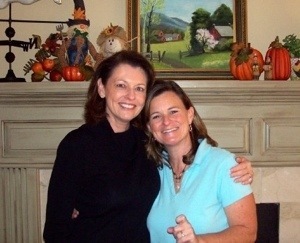 Fortunately, Mary Claire was able to get the day off from work for my visit. 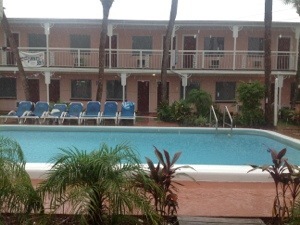 Unfortunately, it rained like something crazy! 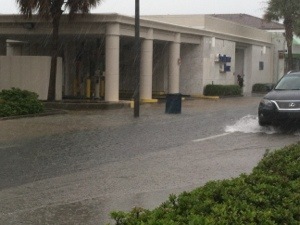 The streets were flooded and we were soaked. We decided it didn’t really matter what we did as long as we were together. So we headed over to Barnes and Noble for hot coffee and a quiet place for Mary Claire to gather her thoughts for her testimony at tonight’s gathering. 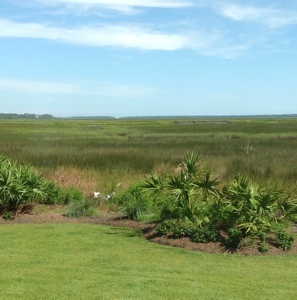 We ate lunch on the dock of the Bait Shop…AMAZING! Did a little speed shopping for a dress, then met the others at their church for a project dinner. Mary Claire gave an emotional testimony of how God has worked in her life to the others in the summer project. It was such a blessing as her momma to hear her tell it. 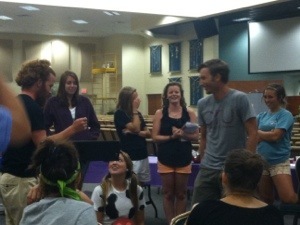 The evangelism team put on a little skit on “How Not To Share The Gospel.” They were really cute. It was time to say good-bye to the guys and the girls stayed to help set up for the Pajama Palooza being held at the church the next evening. A Girls Only sleepover for gals from ages 13 to 103, with a dance contest, speakers and learning more about being a Godly woman. It has been a lonnnng day. Time to go back to the motel. 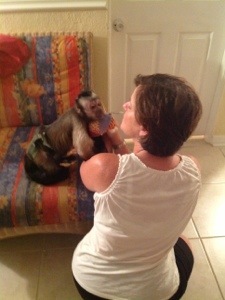 Did I mention that there was a monkey visiting at the motel? Yup! A monkey. 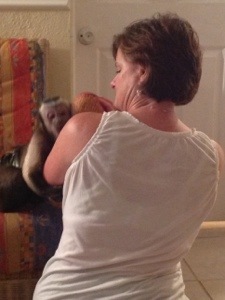 I had never touched a monkey, much less have one hug my arm and “talk” to me. This was crazy! Everything was going great…we were talking, hugging and playing catch with the ball. He hopped over to see the other girls. 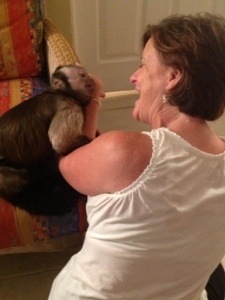 THEN…..Jacob, the monkey, got this crazy look in his eyes! He jumped over to me, grabbed my arm and BIT ME! Dang! What the Heck! His owner decided to scare him with a clown mask, (yes, a clown mask) to punish him. Huh? Then because Jacob was running all over the backs of the furniture and peeking around the others to get a better look at me with those crazy eyes, “daddy” grabbed him by the tail. Jacob started screeching! Needless to say, that was my clue to leave that monkey house and go to bed. Sadly, after only a day and few hours we had to say goodbye. I miss her. 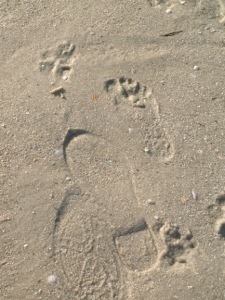 Jesus has walked the sands of Clearwater Beach this summer. The guy who made fun of the Christians who worked at the surf shop at the beginning of the summer, decided to join the CRU crew by the pool and learn more about the bible. The mother on the beach who didn’t know where to turn next in her troubled life, knew she needed to accept the invitation to join her friend at church when a couple of CRU girls spent a few minutes talking to her. The alcoholic coworker who had no hope, sees the light when her new Christian friend went to an AA meeting with her. 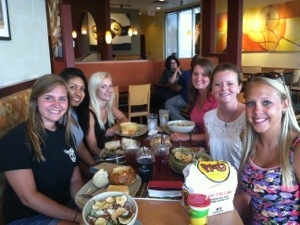 These college kids have given this summer devoted to love on the unlovable, befriend the lonely and feed the hungry. We should all be proud of them. 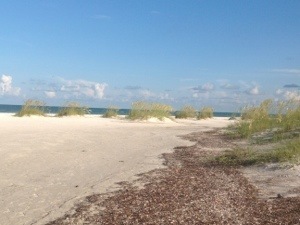 Posted on July 18, 2013 by mary •	This entry was posted in family and tagged beach, CRU, daughters, evangelizing, joy, sisters. Bookmark the permalink.